With all humility and understanding of how quickly things can change for a three-year-old colt at this time of year, Mark Casse is well aware of what’s at stake this weekend. Win the Louisiana Derby with War of Will and Canada’s top trainer will be the man in charge of the likely favourite for the 145th Kentucky Derby six weeks down the road in Louisville, Kentucky. Casse believes his horse is up for the challenge and that status that would come with it, a brilliant evolution for War of Will given the early steps of his career. The journey from a stakes-placed turf horse at Woodbine last September to potentially being the horse to beat in the Triple Crown opener was an intriguing one for War of Will and a testament to the savvy horsemanship of his trainer. With much of the colt’s early training taking place at Saratoga in upstate New York, Casse was certainly of the belief that he had a special horse on his hands. He’d show off War of Will to any visitors to his barn and speak of his high expectations. Finding a race for him to begin what was to become a promising career was a different story, however. Casse isn’t always a big fan of the ultra competitiveness and speed of two-year-old dirt races at historic Saratoga so he looked to the lawn to get the talented colt’s career underway. “I had him at Saratoga and he trained extremely well on the dirt,” Casse said this week on a teleconference with turf writers. “But (two-year-old races at Saratoga) are tough because either you really have to come out running and really kind of get after your horse early if you want to have a chance with him in those type of dirt races. Plan B turned out to be a route well familiar to the 10-time Sovereign Award winner as Canada’s top Thoroughbred trainer. 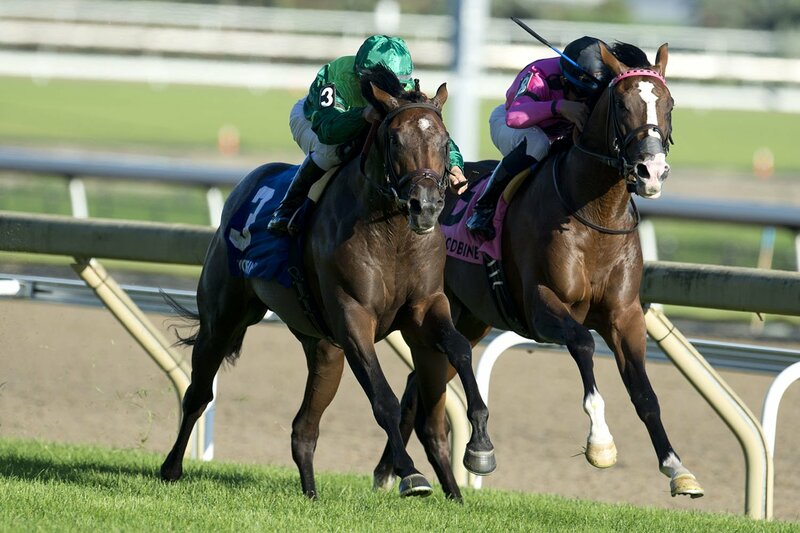 He discussed the idea with owner Gary Barber and shipped the colt to Woodbine for two races – a prep over the E.P. Taylor Turf course and a start in the Grade 1 Summer Stakes. Another runner-up finish in the Bourbon Stakes on the Keeneland turf sent War off Will off to the Breeders’ Cup where he ran in the Juvenile Turf and finished fifth. While the effort was solid, the placing gave Casse the excuse he needed and neither the trainer nor the colt have looked back since. War of Will has won three in a row on the dirt including the Lecomte and Risen Star Stakes at the Fairgrounds, those latter two races his only starts at three. Rather than pursuing a career as a turf horse, where he is today is the early horse to beat in both the Louisiana Derby and beyond the Kentucky Derby. As weighty as that might sound, a win as the morning-line choice in Saturday’s field of 11 would make War of Will the likely favourite at Churchill Downs. Not that Casse is daunted by the prospect of being the 6-5 early choice this weekend at the Fairgrounds. War of Will has impressed Casse in his three-race dirt winning streak, each of them by open lengths. With size, power and tactical speed, he has certainly displayed a potent mix. The morning-line for the Louisiana Derby is the latest bit of evidence citing War of Will as the class of the three-year-old crop thus far. But for trainer Tom Amoss, a Louisiana-based horseman who has been impressed by both of Casse’s colt’s stakes wins, the eye test says at least as much. “I think he is not only the horse to beat on Saturday, I think he is the horse to beat the first Saturday of May if he continues the way he’s going,” Amoss said on the teleconference. “He’s got a quality that is so important which is tactful speed, and he’s displayed it in different ways down here. Amoss didn’t stop there, either. The trainer was in Arkansas last week to watch trainer Bob Baffert’s highly touted duo of Game Winner and Improbable each finish second in divisions of the Rebel Stakes. The horse to beat at the Fairgrounds and the leader in the Derby points race, he will head to Louisville as the consensus favourite should he prevail in the $1 million Louisiana Derby. Showed us enough in his runner-up finish in his division of the Rebel last weekend at Oaklawn. It was his three-year-old debut, after all, and he should move forward off of that effort. While we acknowledge Game Winner may not have been at his best, this colt looked dead fit and strong. When the Baffert colt came at him in the stretch, Omaha Beach found another gear for the win and a prominent spot in the Derby feature. Like his stablemate, this colt’s unbeaten streak was vanquished at Oaklawn but he also showed plenty in his runner-up effort. Baffert was pleased enough with what this colt got out of the race, setting him up for a nice move forward in his final Derby prep. Out of sight doesn’t mean out of mind as we still fondly recall his Fountain of Youth win. McGaughey has to get this one to follow it up in the Florida Derby to remain on the list, but to date he certainly seems capable. Follow Rob Longley’s weekly column on Woodbine.com chronicling the path to the Kentucky Derby, set for Saturday, May 4 at Churchill Downs. Be sure to join us in celebrating the first jewel of the U.S. Triple Crown at Woodbine’s annual exclusive Derby Day Party featuring fabulous food, fashion and entertainment. Tickets are now on sale at Ticketmaster.ca. This entry was posted in Woodbine News and tagged Derby Day Party, Derby Day Party Event, Horse Racing, Kentucky Derby, Mark Casse, Tom Amoss, War of Will, Woodbine. Bookmark the permalink.